The 14th International Transport, Transit and Logistics Exhibition, TransCaspian 2015 and the 5th Anniversary Caspian International Road Infrastructure and Public Transport Exhibition, Road & Traffic 2015 will start on the 12th of May at the Baku Expo Center. Both exhibitions have been supported by the Ministry of Transport of the Republic of Azerbaijan since their foundation. The exhibitions also benefit from official support from the Azerbaijan Export and Investment Promotion Foundation (AZPROMO) and the National Confederation of Entrepreneurs’ (Employers’) Organizations of the Republic of Azerbaijan (AEC). The TransCaspian exhibition closely cooperates with one of the transport industry’s leading organizations, TRACECA. As the transport sector’s leading event in the Caucasus region, the TransCaspian exhibition contributes to the development of transport infrastructure in Azerbaijan, it demonstrates the potential of attracting cargo for transit through the territory of Azerbaijan and helps find the best transportation options for cargo owners. Each year, the exhibition assembles carriers and logistics companies, manufacturers of rolling stock, shipbuilders, manufacturers of products for intra-logistics and information systems for transport, as well as the representatives from sea and river ports, under the same roof. As such, TransCaspian 2015 will present 72 companies from Azerbaijan, Austria, Belarus, France, Georgia, Germany, Latvia, Lithuania, Russia, and Switzerland. Among the participants this year are Access Trans, Alstom Transport, ArcelorMittal, Auto Lift Gmbh, Liebherr, Matrix, Stadler Rail Group, Trans Caucas Terminal, AVP technologies, Brest Electrotechnical Plant, Gomel Wagon Works, GT-aluminothermic welding, MTZ Transmash, Murom Railway Points Works Company, Pakobo, Pervaya Lokomotivnaya Kompaniya (First Locomotive Company), Transmash holding, Uralvagonzavod Plant, and many others. In addition to commercial companies, the exhibition also welcomes Azerbaijan’s public transport structures - Azerbaijan Railways, Azerbaijan State Caspian Shipping Company and the State Automobile Transport Service. The TransCaspian 2015 exhibition is sponsored by Swiss Stadler Rail Group, who manufactures railroad passenger cars, specialized rail cars and trams. The 5th Anniversary of the International Road Infrastructure and Public Transport Exhibition, Road & Traffic 2015, held alongside the TransCaspian 2015 exhibition, will provide a platform for professionals involved in road and tunnel design and construction, road safety, public transport and ITS. The anniversary exhibition will be attended by 52 companies from Azerbaijan, China, Czech Republic, Germany, Russia, Turkey, and the USA. Participants at the exhibition include Azauto, Azvirt, AzerInshaat Servis, Azer-Turk AS, Azeryolservis, AZD Praha, Carlson Software, Cepas, Complex Technical Centre Metallokonstruktsiya JSC, Dorojnie Systemi, E-Mak, Ekomobil, Evim Construction, Fujian Tietuo Machinery, KentKart Ege Elektronik, Intelligent Transport Management Centre in Baku, Hofmann Gmbh, Holcim Azerbaijan, Jenoptik Traffic Solutions, Kolin Construction, Proyapi, Tarsa Kompozit Boya Makina, State Automobile Transport Service, Stop Showroom Service, TENSAR, Ultra Computers, Zitron, and many others. These companies will present services related to the design and construction of roads, bridges and tunnels, as well as road-building equipment and materials, road safety devices, road marking equipment, ventilation systems for the underground, car and traffic monitors, software for the design of urban infrastructure, Intellectual Transport Management Systems, buses and much more. Visitors can expect to see many new pavement and road construction products. This year, the test driving of electric cars (battery-driven vehicles), presented by Ekomobil, will be held in the Baku Expo Centre’s outside area. TransCaspian and Road and Traffic will be accompanied by a business program. As such, on the 12th of May, the Baku Expo Center will host a seminar organized by AVP Technology. The seminar will discuss topics such as: “The system of automated driving for the KZ8A electric freight locomotive”, “Unified automated system of accounting diesel (UASAD) based on-board recorder of parameters for the RPDA-T locomotive”, “Measurement system for AC and DC electric traction rolling stock with AC/DC meter (accuracy class 0.5s) for commercial accounting of power consumption”. On the 13th of May there will be a seminar on software for time and location planning (TILOS), which is designed for the management of construction, in particular, infrastructure projects realized by Ultra Technologies. Participation in the seminar requires online registration, which can be accessed using the following link:http://seminar.ultra.az/tilos. On the 13rd of May, the ceremony of signing contract between Stadler Rail Group and Azerbaijan Railways will take place within the framework of TransCaspian 2015. Thus, the TransCaspian and Road and Traffic 2015 exhibitions represent important strategic projects for Azerbaijan. Over a period of three days, guests will have an excellent opportunity to expand and establish new, effective and mutually beneficial contacts, enter into agreements and promising investments, exchange experience and assess the market. The TransCaspian 2015 and Road & Traffic 2015 exhibitions are organized by Iteca Caspian and its partner, the ITE Group. Work on the project involved a network of partners from the ITE Group - ITE London, EUF (Turkey), GIMA (Germany), ITE China (China), ITE Gulf (Dubai), which attract international companies to participate in the Azerbaijani exhibition. 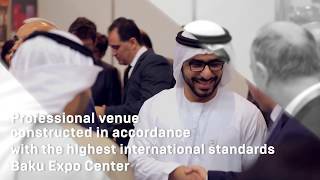 The official partners of all 2015 exhibitions are: the Jumeirah Bilgah Beach Hotel and the Qafqaz Point Hotel (as the official hotels); Greenwich Travel Club (as the official tour operator); and SafeLife (as the official security partner). The exhibitions will continue until the 14th of May.